In addition to our own parks, Warrenville is surrounded by the green space provided by forest preserves and Fermilab, and Cantigy. Studies show that spending time outdoors helps everyone live better. This section will remind you of opportunities offered in our own backyards. There's a great line-up of Fourth of July festivities right Here in Warrenville! 7:30-11 PM Band: The New Odyssey performing with up to 30 different musical instruments. The race starts at 8 am. Both the start and finish lines are in front of the Warrenville Park District. Even if you are not running, come out and cheer on your friends and neighbors. You can sign up until 7:30 am on race day at the Community Building. 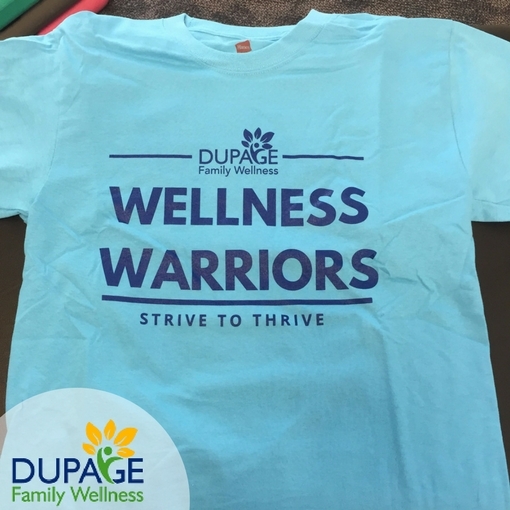 You might see people wearing blue Wellness Warrior shirts. This group is improving their nutrition and life-style because they want live a long and happy life in a healthy community. This race is the first in-person meet-up of the group. Cheer them on, come to the booth, or join the group of Wellness Warriors. Decorate your bike for the kid's parade. Noon Start Parade travels south on Warren Av to Cerny Park. 2:30-3:30 PM Pickle Ball Demo see the newest sensation for yourself! Flag Raising & National Anthem followed by SPECTACULAR FIREWORKS! This is the place to be! 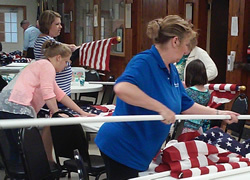 The Warrenville VFW Post 8081 will be transformed into a sea of flags the week of Memorial Day. The event is called the Warrenville Healing Field®. Keep reading for the details on how you can visit, volunteer, or buy a flag. Every Day: Flag Raising Ceremony at Sunrise (about 5:20 am), and Flag Lowering Ceremony at Sunset (around 8pm). Opening Ceremony: Wed May 20 at 7 pm followed by the flag lowering ceremony at sunset. Flag Retirement Ceremony: Friday May 22 starting at 6pm. Bring tattered flags to be retired. The VFW serves a Friday night fish fry, starting at 5 pm. The flag lowering ceremony will be at sunset. Memorial Day Ceremony: At noon includes Tunes of Glory, bagpipes, honoring of veterans, and patriotic music. Many volunteers are needed to make this event a success. Please consider volunteering a few hours. Sign up below. Organize your club, neighbors, or friends to work together! Purchase a flag to honor service or sacrifice. Tag it with your message of rememberance. It could be a general "thank you", or an honor for a specific family member, friend, teacher, loved one, or any hero. At the conclusion of the event, take the flag home to continue the tribute year round, share it with a loved one, or donate it to the VFW. Or - the link to purchase the flag to make a donation. Cost: $35, includes pole and gold ball on top. Click Here to Order Your Flag Today! See You at the Healing Field! Questions? Contact Rudy Keller (rudy_keller@ipsd.org or 630-465-9723), Karen Leonard (karen_leonard@ipsd.org), or Dan Leonard for brochures and more information. The brochure also contains a form to order a flag. It's easier to keep an exercise routine when you have a "buddy". Dr. Jamie Tripp Thomure will be your walking buddy. Walk on the prairie path and get some exercise as you chat about whatever is on your mind. The distance and speed will be determined by the group. No matter what your fitness level is, come try it out. Count your minutes for the Mayor's Fitness Challenge or get in shape for the Firecraker 5K. It starts May 11. Record your minutes, and try to beat Mayor Brummel. He's a tough competitor, so it's not easy. Whether you can keep up with him or not, the exercise is good for you, and participants only need to log 150 minutes/week to get the coveted Mayor's Fitness Challenge T-shirt. 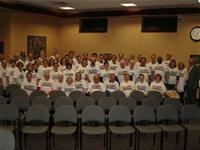 Click for Mayor's Fitness Challenge Sign Up & Log Your Minutes. You will be in the next group photo. Both Johnson and Bower Schools are participating. There will be designated routes and extra volunteer crossing guards to keep everyone safe. Participating students meet the mayor or fire chief. All students learn about bike safety and reducing air pollution. Get the flyer for Bower Schools. and more info for both Bower & Johnson on the city website. Don't go to grade school? Drive carefully that day. Even better, figure out how to ride your bike to work too. Ride the Bike safety course, and get your photo taken with the mayor. Get you bike checked out - minor adjustments made. See you out on the trails! Get moving now, and you'll be in shape for Warrenville's Annual Fire Cracker 5K on July 4, 2015. Read on for some unique Easter Egg Hunts - fun for the whole family! It's at the dog park (not the one in Warrenville though). Dogs hunt for Easter Eggs filled with doggie treats. Cost is $1/dog. Children 14 and under jump into the pool to gather floating Easter Eggs filled with surprises including candy, toys, or a coupon redeemable for a bigger prize. Bags to collect eggs will be provided. Adults must accompany children. 3 separate hunts for children of different ages. Cost is $8/child. Sponsored by Itasca Park District - Get more details and schedule. Bring a flashlight and a bag or basket. Collect eggs and prizes in the dark. For children ages 9-13, accompanied by a parent. Cost is $10 / child for Naperville residents, and $14/child for non-residents. Easter Egg Hunt at 10:00 for Children 10 and under Fun! Prizes! Warrenville VFW Post 8081 will be transformed into a field of 500 American Flags arranged in perfect rows and columns. It will be an awe inspiring tribute to honor those men and who sacrifice the time, talents, and even their lives for our freedom and for this great land. Each flag will fly in honor of a hero, family member, friend, of loved one and will be tagged with your personal words of remembrance and/or honor. The Healing Field® Committee would like to welcome you to be part of this event. Purchase a flag in honor of all who serve and sacrifice, and at the event’s conclusion, continue the tribute year-round as you take this flag home or share it with your loved one. 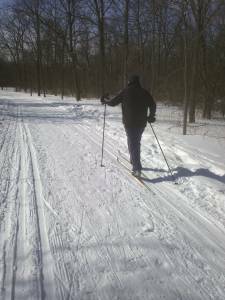 Herrick Lake: The trails are groomed and great shape for cross country skiing or walking. If you walk, please use the center of the trail so you don't disturb the paths for the cross country skiiers. 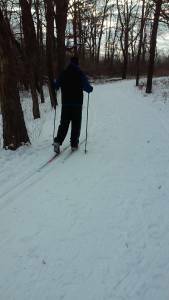 Arrowhead Golf Course: Groomed trails and ski rental - connects to Herrick on the west side. (call before you go, website says trails are closed, but that seems crazy). 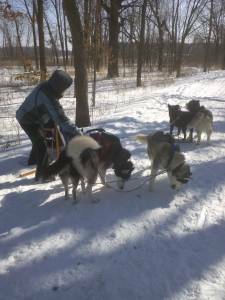 McKee Marsh: One of the two Forest Preserves designated for dog sledding. If you are a dog lover, you should see lots of beautiful huskies out there. Photo above was taken at McKee Marsh. Blackwell, St. James Farm, and other Forest Preserves: Tubing, Snow Show rental, ice fishing and more, but it might be too late for some activites that need more snow and cold - but check it out. Kline Creek Farm: "Life on the Farm" and "Ice Harvesting" programs today - see Kline Creek Farm Calendar. Red Oak Trail: In North Aurora, north of Butterfield on 25. Just got back from skiing there and the snow was still fine. Prairie Path, your neighborhood - all great places to get out and take a walk. Cantigy is closed in January. How will you get outside today?? Get in a festive mood. 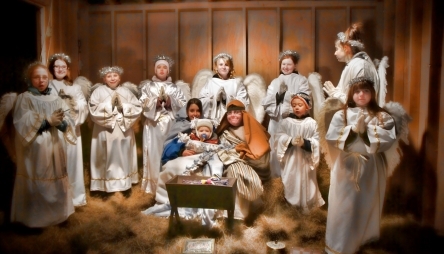 Watch the traditional Christmas story performed by live animals and the children of Trinity Lutheran Church. Join them in singing Christmas carols, and warm up with a hot chocolate and a cookie in the fellowship hall. Have you ever cut down your own Christmas tree? It can be fun to pack up the family, drive out to the farm, pick out the perfect tree, and cut it down yourself. Hours of Operation: Through Dec. 23 daily from 10 a.m. to 7p.m. Cost: You-Cut trees, $45. Pre-Cut trees, $8 per foot. If you're willing to travel a bit further, here's a guide to tree farms in driving distance from Warrenville. Enjoy the Season and Keep Warm! If you have other outdoor holiday activities or traditions that you's like featured here, send an email to sue@warrenville.info. Take a minute to honor our veteran's on Nov 11, 2014 with local Veteran's Day celebrations. If you are a vet, scroll down, and find some free-bies to thank you for your service. Intersection of Stafford Place and Warren Ave. 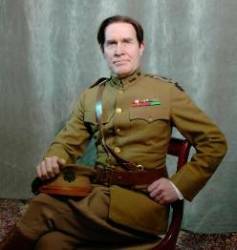 Celebrate the 100th anniversary of World War I, as RJ Lindsey tells the story of the “war to end all wars” thru the eyes of Charles Dawes. You will experience the people, places and political climate that plunged the world into war. Dawes was a colorful banker and businessman that served in WWI and later became vice president and a Nobel prize winner. Refreshments will be served – Registration required. Sunset to 9pm – 2000 luminary candles light the roads and Parade field. Drive thru the roads, or walk the fields. Free coffee for veterans during these hours at the café. 7 pm – Drum and Dance performance marks the opening of a traveling Wall of Honor exhibit. The weather is beautiful all week, and a gorgeous weekend is predicted. Looking to get outdoors? There's something for everyone at St. James Farm on Saturday September 27.